United States Avenue in Gettysburg National Military Park, Pennsylvania. 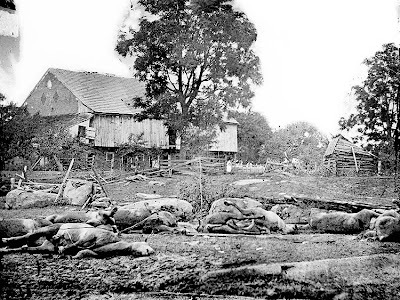 The Abraham Trostle farm is famous for the large hole made by a Confederate artillery shell that is still visible today and a picture of dead horses in front of the barn that was taken after the battle. Located centrally on the battlefield, it was in the middle of severe fighting on the second day of the Battle of Gettysburg. In mid 1863 when fighting broke out near the farm, Abraham Trostle, his wife, Catherine, and their nine children lived here. They stayed on their property until the fighting got too close and they were forced to abandon their home. The 9th Massachusetts artillery battery made a stand around the Trostle Farm on July 2, 1863. This was their first battle. 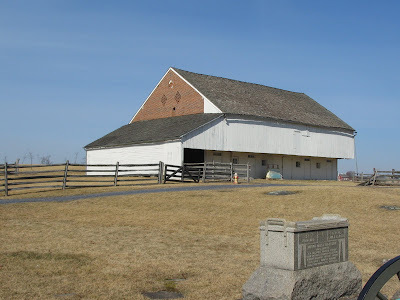 Reportedly the troops took cover in the Trostle barn, waiting for the Confederates to get closer. As the rebel troops approached the 9th Massachusetts Battery opened fire. However, the rebels continued their advance until they had the battery trapped inside the building and began shooting the horses, who were still strapped to their harnesses. The 9th Massachusetts Battery continued to fight but in the end the remaining survivors fled, leaving behind their guns, the wounded and the dead. During this battle, the 9th Massachusetts Battery lost five of it's six guns and reportedly 80 of their 86 horses. The Trostle family was never compensated for the damages to their property. They sold the farm to the US government in 1899.